Soup. It's what runs the universe. In a place where steaming hot monobrew is as good as gold, you find yourself crash landing on a planet ripe with tasty ingredients. Now all you need to do is build a factory, harvest stuff, defend your base, and send your soup creations to other planets so you can corner the market. 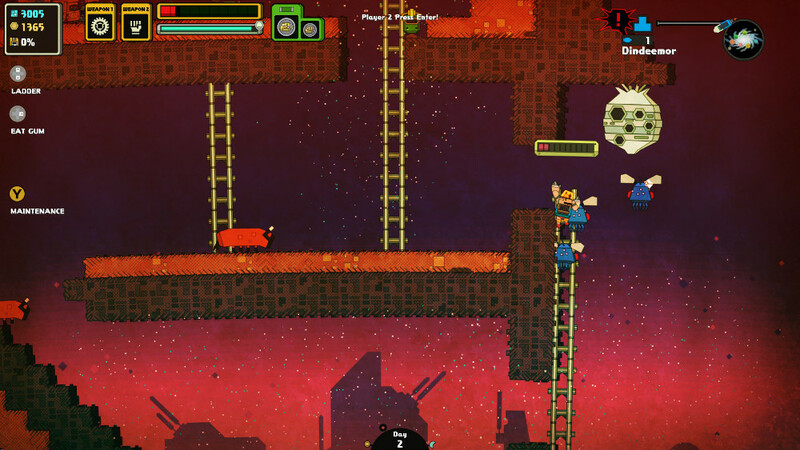 All in a day's work in the latest PixelJunk game Nom Nom Galaxy. Nom Nom Galaxy is a sidescrolling simultation that neatly blurs itself over to sandbox territory. 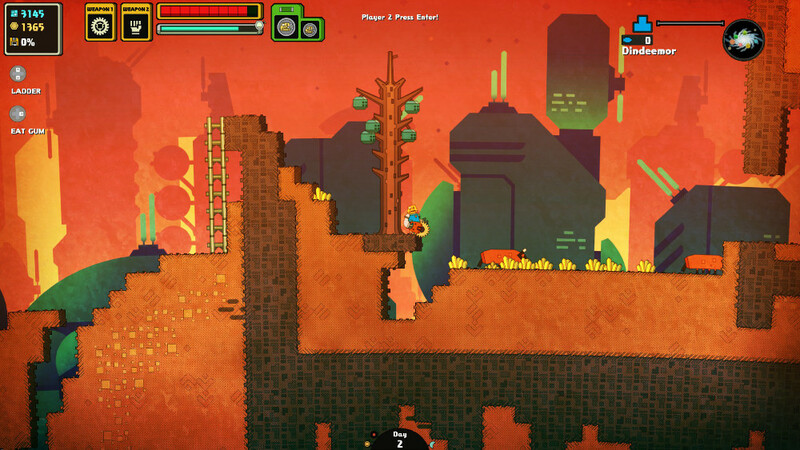 You'll immediately be reminded of titles like Starbound and Terraria when you boot up, but as soon as you get into the swing of things, you'll see just how serious this game takes its soup production. You'll build, you'll explore, then you'll build some more because what you built before wasn't very efficient now that you're a soup-making mogul. Getting ingredients is one thing, turning them into soup and selling them is another. Your factory is comprised of simple machines that take ingredient input and produce cans of soup. Carry those cans to soup rockets to send them off for sale on other planets. Pretty simple. Now, things get more interesting when you start expanding beyond one ingredient and a few soup makers. Sure, you can manually carry things back and forth, but it's not very efficient. Instead, expand your base or hire some helpful robots to do the carrying for you. Nom Nom Galaxy throws in a few limited-ability machines that do simple tasks in your stead. Need something carried horizontally? There's a 'bot for that. How about vertically? 'Bot for that, too. 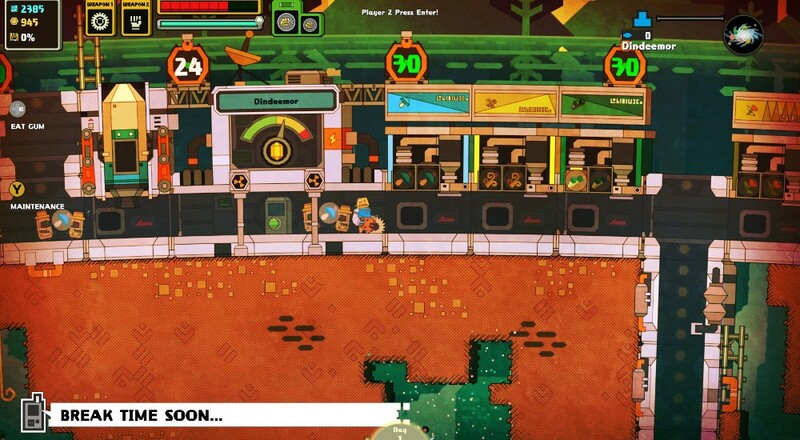 Farming and fighting are also part of Nom Nom Galaxy's repertoire. Non-enemy ingredients can be brought back to your base and planted instead of turned into soup. As long as you can replicate the ingredient's original growing conditions (on a ceiling, underwater) you can make more, and this time you won't have to walk across the planet to harvest. Even better are the robots you'll eventually unlock that automate much of the farming process. Chain them together with your other 'bots and you've got yourself a fine and fancy soup factory. Pop up a few shot towers to defend against rival soup industries and you're pretty much set. Page created in 0.7688 seconds.